One of the most important purchases as car owners is tires, as this is the vehicle’s most important safety feature. Let’s face it – after the often intimidating car buying experience, the last thing you want is a repeat when replacing your car’s tires. Here are 9 important tire buying tips to make the buying experience a little better. Growing up with my mechanic dad, believe me, I know the importance of good tires. It’s the only thing between you and the road. You and your family’s safety depends on good tires. Keeping them properly inflated saves fuel. Worn tread is not a good thing and can cause an accident. Yeah, yeah, check all that. But if you’re like me, buying tires ranks right there with going to the dentist. You’d really rather do ANYTHING but make an appointment. You know you have to do it, but you put off the purchase until it’s perhaps the last minute. Let’s remove the stress of the tire buying process with these 9 secrets you should know about buying tires. Yes, tires all look alike. They are round. They are made of rubber. They have indentations called treads. And they are perhaps THE most important safety feature of your vehicle. Just like shoes, tires are made by multiple “designers,” including Bridgestone, Continental, Goodyear, Michelin, Dunlop, Yokohama, and more. And like designer shoes, choosing the right tire brand depends on so many facets of your vehicle and driving habits. For example, if you live in the northeast, winter tires with its softer rubber designed to grip on a slippery surface will give you more traction in the snow. (You wouldn’t wear stilettos during a winter snow storm, right?) If your home is in Florida, winter tires wouldn’t make any sense, while summer tires (made of tougher, more rigid rubber) might last longer in the hot weather. The most popular tires are all season (all weather) which perform well in most driving situations. You don’t have to be an experienced auto mechanic to know enough to be safe. 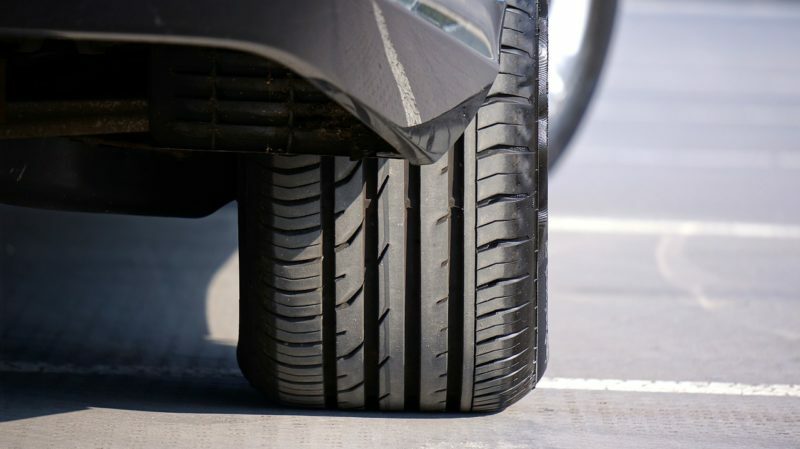 Take time to LOOK at your tires – all 5 of them! Yes, it’s important to check your spare too. Do they look, worn or damaged? Do they pass the penny test? Insert a penny into the tire tread with Lincoln’s head pointing toward the center of the tire. If its head isn’t partially hidden by the tire, the tire needs to be replaced. And it’s okay to confirm your results and have your tires checked by a professional. Perhaps the biggest mistake consumers make is choosing the right tire. And this is as easy as getting down and dirty to look at the code on the sidewall of your tire, a combination of letters and numbers. These indicate the size, type, and performance of the tire. The first three-digit number in the tire size refers to the tire width. For example, my 2014 Ford Escape’s tire size is 235/45 R19 tire, the tire width is 235 millimeters, measured from sidewall to sidewall. Aspect Ratio is the ratio of the height of the tire’s cross-section to its width. The two-digit number after the slash mark in a tire size is the aspect ratio. For example, in a size 235/45 R19 tire, the 45 means that the height is equal to 45% of the tire’s width. The bigger the aspect ratio, the bigger the tire’s sidewall. Wheel Diameter is the size of the wheel measured from one end to the other. This is the size of the wheel that the tire is intended to fit. A size 235/45 R19 tire is made for a wheel with a 19″ diameter. While this may sound Auto Geek to you know, tire codes are important to know when pricing your new tires as it’s the unique descriptor. When you do finally take the step to shop around (see below), most tire dealers will ask the make, model, and year of your car. But you may still have different size options as well. Your choices may include bigger tires fill the wheel well, or smaller less expensive tires. Whatever your choice, make sure the tires fit the recommended speed rating; can handle your car up to a designated top speed; and can accommodate the weight of your car (load rating). Check your tire’s sidewalls for these codes, or simply open your owner’s manual. Chances are you’ve been driving the car for some time. Think about your driving experience. Is something not up to par? Are you looking for a more comfortable ride? More steering control? Less noise? Longer wear? Tires that are standard with a new car are usually one size fits most, so if you feel, you might be better with a new brand, then ask your tire technician for your options when buying tires. I recently replaced my car tires for the first time since purchasing my Ford Escape in the fall of 2013. The Continental tires worked great in the Colorado winter, driving in the mountains, and even on some off-road trips. And they lasted over 40,000 miles. So if it’s not broke, then why change the tire brand? For convenience, many consumers first consider their local tire shop or discount tire store. It’s often a matter of convenience and usually located closer to your home. Prices are usually reasonable, and I’ve discovered that the service managers or technicians are very helpful. Quotes are also as simple as a phone call or stopping by the store. Take all your options and quotes and start reading the reviews. See what the experts say about the tires. Expensive doesn’t always equal the best tires. Sometimes inexpensive tires wear as well as their premium competitors. But sometimes you do get what you pay for. Subscription service like Consumer Reports separate tires into categories, such as braking, hydroplaning, tread life, ride comfort, and more. But there are so many reviews out there available simply at a click of a mouse – google your car, tire brands, etc. When you’ve read all the reviews, it’ll help you understand the differences, allow you to ask for what you want, and hone in on buying tires. Gather your reviews and compare these to your quotes. Be sure to consider a warranty when buying tires. The warranty gives you an idea of how many miles you should get out of the tires. On most cars, tires last three to four years (40,000 -80,000 miles), which is covered by the warranty. However, if you traditionally put a lot of miles on your car, consider adding hazard insurance, usually only $15-$20 per tire. Also, many of these local tire stores include complimentary tire rotations, flat repairs, etc. – so be sure to ask! Since tires can be a huge expense, consider financing options. On my recent tire purchase, I spent over $1,100 for 4 new tires. I had saved half of that, so instead of putting the balance on a credit card, I applied for Discount Tire’s 9 months same as cash financing program. I qualified! Just be sure to pay off BEFORE the 9 months as the interest rates after the interest-free period are extremely high! You’ve done your homework. You’ve shopped around. You’ve read the reviews. Prepared your budget. Now, go ahead and take the plunge! With these 9 tips for buying tires, purchase your tires with confidence and take your car on the road. I appreciate you talking about reading online reviews when looking to replace your tires. We just moved to a new town and are going on a road trip in a few weeks. It is important to remember that consulting with a professional and rewarding your vehicle’s manual can help you find the best tires for your trip. I appreciate your tips on making sure the tire size fits the speed we will regularly be driving the vehicle at. It’s important that you feel confident in your tire choice so that you can drive with peace of mind and comfort. Plus, doing your part to make sure you get tires that are the right size can help you financially in the long run since those tires will perform more efficiently. I really like your recommendation to consider what you want to spend on the tires. It makes sense that it could be good to get the right tire for how you drive as well as ones with good reviews. I’ll have to keep this in mind because I think I’d be better off buying more expensive tires that are well known and loved. Thanks for the post! Diana, I had no idea that tires depend completely on your driving style and personality. I personally like to go camping a lot which requires a lot of travel along dirt roads. I think that I should find some tires that could help to give me some added traction as I head into the mountains. I recently noticed my car was starting to slip around a little when it last rained. I checked the tires suspecting they might be the issue, but I wasn’t sure how to gauge if they’re worn enough for replacement. I’ll be sure to utilize the test you mentioned about putting a penny in the tread to measure its depth. Thanks for the tip! You make a really good point about how size matters a lot when you’re picking out tires for your car. After all, choosing the wrong fit could lead to a serious accident down the road. Fortunately, even if you don’t know the exact tires you need for your vehicle, it is pretty easy for the vendor to find that out for you when you bring your car in. I like that you talked about how where you live should help determine what kind of tire you choose for your car, and how if you live in a snowy place you should choose a softer rubber for winter driving. I’m going to be buying new tires next week, and I hadn’t thought to consider the weather of the area I live in. I think keeping weather and seasons in mind is a good idea when you’re buying tires, especially if you have really snowy winters in your area like I do. I have been looking into getting some replacement tires for my car but I am not sure how to choose tires since my car came with them in the first place. You mentioned that it is possible to ask a tire technician about what options there are with new tires so that you can have a more comfortable ride. I will keep these tips in mind when looking for a tire service. Thank you so much for mentioning how you should take the time to choose tires for your vehicle that can fit its designated speed. It is important to remember that taking the time to understand this and to do some research on it can help you find the best tires you can. A friend of mine was talking about how he needed to replace the tires for his crane, do you have any suggestions about this? I like how you mentioned that some dealerships may be willing to price-match. My husband’s car needs new tires soon and we don’t know where to look other than our dealership. We’ll have to see if they price match and look around. I want to buy a car and this article about tires is what I’ve been looking for. It’s awesome that you mentioned about shopping around in order to find out prices. I’ll definitely follow these recommendations in order to choose appropriate tires. I took my car in for an inspection, and the auto repair mechanic said that my tires are getting pretty old and I should look for some replacements soon. I have never bought tires for my car before and don’t know what to look for. I didn’t know that car tires had codes on them! I will have to see if the tires I have now has a code on them so I know what size I should get. That would be really helpful. Thanks for the information! Thanks a lot for mentioning how you should take the time to check all of your tires when thinking about replacing them. I understand that doing some research and consult with a professional can help you find the type of tires that suit your vehicle and your driving properly. It is important to remember that doing some research and comparing several stores can help you find the best rates and tires that can last you as long as possible. I was thinking about changing my car’s tire soon as it doesn’t feel right for my trips out of town. That might be because I need these all season tires which performs well in most driving situations as you’ve mentioned. It sounds perfect at the moment which is why I’ll be sure to try and look for those later when I get by a tire shop near our area. Thanks! My husband’s truck is in need of some new tires, so we are wondering how to find the best ones. So thanks for advising that we go to different places like stores and dealerships to compare prices. Since we want the best prices for the best tires, we’ll be sure to visit many different stores. I liked your suggestion about thinking about what you want from the replacement tires. I never really thought about how tires could contribute to gibing you less noise or more steering control. I’m going to be thinking about a lot of things before I get some new tires, but I think the shopping experience will be better because of this. Thank you for your help. As a first-time car owner, I never knew that I should also consider the weather of the area where I will be driving most of the time when buying tires. My new work involves moving from one region to another. And I prefer to drive by myself instead of relying on public transportation. It’s great to know as well that there is actually tires suitable for all season. Thanks for this informative article. Definitely a good article! Many points worth listening to on tires. Customers spend a lot of money on good tires, so it is worth the knowledge and maintenance. One of the best investments you can make not just for your vehicle but for your family. I appreciate the advice to read reviews about tires before purchasing them. My car needs new tires before I go on a trip. To ensure I get the best tires for my vehicle, I will be sure to read reviews online. Thank you for pointing out that you need to know when it is time to replace your tires. My husband blew out a tire yesterday. We will have to shop around and find him the best deal on tires possible. You make a great point that you should regularly check your tires to see if they pass the penny test and if they look worn down. I am thinking about getting new tires and it is interesting that you say to think about the size and the recommended speed rating of your car and I will check my owner’s manual so that I know this before I buy the new tires. Also, I appreciate that you say to shop around and get estimates from different tire shops so that I can find tires that fit in my budget and are high-quality. My father recently bought a used car, so he may need to replace the tires soon. I love how you mentioned that he should shop around for the best price for quality tires, as this will save him money but still keep him safe. These tips will really help my dad out, so thank you for sharing them. I like the tip that you gave to use a penny to test if you need new tires. My wife and I have been wondering if our car needs new tires, and it would be important for us to know if we do for sure. I will be sure to mention the penny test to my wife, so we can get new tires if we need them.